Unconventional aero. How did he go so fast? Like Chris Froome in an unconventional riding position, the Summer seems to have flown by (I’m an engineer, similes do not come easily). Thankfully there’s been a bumper crop of sporting spectacles to sate our appetites. In this post I’d like to focus on a pet topic of mine, cycling aerodynamics. Right at the start of the Summer we saw Chris Froome pedal to his third Tour de France victory. He grabbed an initial lead over his rivals while flying downhill in an unconventional tuck position. The interest surrounding the move had many speculating on the advantages gained and even some computational analysis which concluded that the safer, standard descent style may have been quicker (his extra speed could have been down to the use of a 54 tooth front ring as opposed to his usual 53 tooth ring). It wasn’t Froome’s risky descending which caught my imagination though, it was a video I spotted a short while back which showed a much riskier (and arguably much more effective) descending technique. In the video we see a cyclist riding a fixed-wheel bike (one gear, no freewheel) before they’re passed by a group of cyclists pedalling standard, geared bicycles. With a fixed gear he isn’t able to pedal much faster and so he adopts a crazy position — a solid, horizontal plank propped on top of the saddle. A number of things are clear from this point on. Despite the fact he’s stopped pedalling he begins to accelerate. Despite the fact the other cyclists are still pedalling, he passes them all. The lead cyclist, in a tucked position and pedalling furiously, is unable to accelerate to match his speed. It may seem strange that without putting in any effort (pedalling effort, holding a full plank on a racing saddle can’t have been easy) the cyclist is able to pass a train of riders who are all expending large amounts of energy. Can a change in position be so effective? 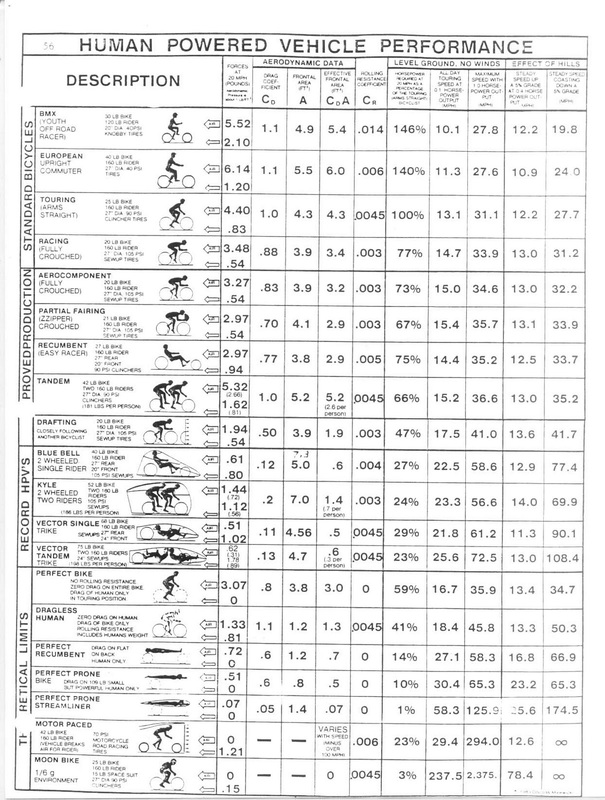 The datasheet shows a number of human powered vehicles and their associated aerodynamic properties. I really like this because it proposes real and theoretical scenarios (I’m holding out for a go on the moon bike). It contains lots of important, key information. Cd, Coefficient of drag: This value is a way of combining lots of complex aerodynamic behaviour into a single number. In short, it describes how effectively a particular shape can move through the air (or any fluid). Long thin shapes have lower values and short wide shapes have higher values. Have a look at the Wikipedia entry to see the values for simple geometric shapes and some further description. NB: Due to the complex behaviour this number hides, Cd is not constant, it changes with speed, surface texture etc. However, for the purpose of this blog post I’m assuming constant values. A, Frontal area: Quite simply, how much air you are pushing aside. You can reduce your frontal area by changing your shape. In the simplest case, you duck down onto your drop handlebars to hide yourself from the air. In the extreme example above, you only present your head and shoulders to the oncoming air, dramatically reducing your frontal area.Of course by doing this, you’re unable to access to the pedals (unless of course you redesign the whole bike so it can be used in this position). Cr, rolling resistance: Quite simply, how much resistance is created by the rolling elements of the bike (gears, tyres, bearings etc.) the single value is used to calculate a total force value. Examining the datasheet we have some options available to try and recreate the video. The information above gives us appropriate values to re-create the scenario. We have two examples of cyclists in a traditional racing position (with and without aero-components). We have the values for a cyclist in a ‘perfect prone’ position and for a bike with a dragless human. By combining the latter two examples we have a way of representing our brave, aero-cyclist (I’m going to refer to him as the prone cyclist from now on). A few caveats to mention before we get started, the values above are not going to be perfect. For the perfect prone cyclist it mentions that it’s for a small person of around 50 kg. Also, it’s unlikely that our cyclist is in a ‘perfect’ position. We’re going to have to adjust some of these values upwards to account for the discrepancies. I’ve constructed a simple differential model of a cyclist which balances the propulsive and resistive forces and calculates the resulting motion (for a more detailed description of aerodynamic forces see a previous blog post). Using the model we’re able to alter parameters such as the slope of the road (increasing or decreasing gravitational propulsion), and aerodynamic characteristics (to match those from our datasheet). I’ve used the model to explore certain scenarios. I pondered trying to recreate the video as closely as possible but I decided against it. It’s hard to calculate what the slope of the road is from the footage and judging relative speeds is equally difficult. I did consider using a typical fixed-gear ratio and measuring the cyclists cadence to determine speed but, to be honest, I had better things to do. Instead I’ve decided to look at how each cyclist would perform in a head-to-head race. For the sake of this simulation I’m going to assume that the prone cyclist is able to lie perfectly horizontally on their seat at any speed. I’ve also made a few other assumptions. Both cyclists + bike have a mass of 85 kg. The slope of the road is 10% (5.24 degrees). I’ve used the results of the model to create an animation to show the relative speeds of each cyclist (it should be obvious which is which). Please ignore the frames per second number in the corner, it should be running at 10 fps which will illustrate speed and time elapsed correctly. (Again, I’m an engineer, not an animator so try to look past the aesthetics and the fact the road is flat!). For the first animation, neither cyclist is pedalling (0 Watts of power from each cyclist). As you can see, after a few seconds the superior aerodynamics of our prone cyclist begin to yield an advantage until his increased speed results in him disappearing from view. However, we’d expect this wouldn’t we? Neither cyclist is pedalling and we know our prone cyclist is more aerodynamic. I think the real question is how much of an advantage does the improved aerodynamics give? For my second animation I’ve given our normal cyclist an advantage — he’s elite level. This cyclist is able to generate a continuous output of 500 Watts (have a look at this datasheet to see how it compares to other athletes). The beginning of the race is not surprising. Our normal cyclist is able to generate a large amount of power to accelerate quickly while our prone cyclist only has gravity. At low speed aerodynamic forces are very low and the prone cyclist is left in the dust. After some time our normal cyclist reaches a happy equilibrium. The propulsive forces are equal to his drag. What may come as a surprise is that after some time our un-powered, prone cyclist comes from behind to race past! In the original video we can see the group of cyclists pedalling furiously to keep up. It’s no wonder they weren’t able to accelerate to match him! Here’s a plot of the distance between the cyclists over a period of two minutes (a negative value means our prone cyclist is behind). I also modified the simulation so that both cyclists stayed exactly level. The plot below shows how much power the normal cyclist had to generate to keep up! Only the very best cyclists are able to generate 1,200 watts for more than a few seconds! You can see from the plot the exponential nature of the curve and the unavoidable nature of aerodynamics. If you double your speed, you quadruple your drag. If you want to go quickly, go aero! So to round this up let’s look back at the points I stated at the beginning of the post. Despite the fact the prone cyclist has stopped pedalling he begins to accelerate. Now we’ve explored the physics of it all, none of these things seem so unbelievable. Aerodynamics give a huge advantage to the rider. So much so that excellent aerodynamics are more than a sufficient replacement for huge power outputs (providing you’re going downhill). Of course, if you’re not on a slope then you’ll need to combine aerodynamics with the ability to pedal. If you haven’t already I implore you to explore the world of human powered vehicles. Where innovation isn’t stifled by regressive rules about riding position or construction types. Superior aerodynamics is why Bradley Wiggins’ 1 hour cycling distance record is 54.526 km and the human powered vehicle record is 91.55 km! What we’ve explored here are extreme examples, large changes in position to yield large aerodynamic advantages. Of course less extreme examples won’t give such extreme benefits, but there are countless examples where paying attention to aerodynamics might have given the crucial edge. Anyway, now I have a nice cycling model and a Matlab toolbox that allows me to create childish animations. If anyone has any ideas of how to explore differences in cycling performance (my model can go uphill as well as down!) then let me know and I might do a blog. Thanks for the post. On a similar topic I would be interested to know if you agree with Cervelo’s science regarding aerodynamics: on their website they challenge the common view that aerodynamics is only for ‘fast’ riders and appear to claim exactly the opposite! Thanks for reading! And thanks for pointing me to that post. It’s got me thinking. What they say isn’t wrong, but it also isn’t very insightful and I don’t know whether it justifies their claims that ‘everyone’ will benefit from the latest aero kit (like a helmet for example). Let’s explore in more detail. The article says that if a slower rider gets the same aero benefit as a fast rider, then their speed increase won’t be as great but their time improvement (over a fixed length course) will be larger! Wow! So a slower rider gets much more benefit from aero kit? Well, the situation is much more complex than that in reality. Before I go into the nuances though I wanted to discuss the maths that this claim is based on. Using the time-trial example they have in the article, let’s assume that a rider reaches their top speed almost immediately and stays there (makes things much easier). At a terminal velocity the drag forces are equal to the propulsion forces. Now if we reduce the drag force (by popping on an aero helmet for example) the riders speed will increase until the forces are balanced again. The percentage speed increase is equal to the square root of the percentage decrease in drag force. It’s a little hard to go through in a comment section (let me know if you want some equations to back this up) but basically if you reduce drag force by 4%, speed increases by 2%. I.e. the faster you’re going the bigger the increase! Let’s look at the other claim, the improvement in time will be better for the slower rider. This is really just stating the relationship between speed, distance and time and making it sound like a surefire reason to buy expensive kit. Simply stated, if you increase your speed by a X% over a fixed distance, the time taken to travel that distance will decrease by X%. The slower you’re going, the longer the time taken to complete the distance, the better the time increase for a fixed distance! So to summarise, if you reduce your drag force by X2% your speed will increase by X% and your time over a fixed distance will reduce by X% too. Now, onto the more nuanced part of the argument (I hope you’re still with me!). Does this mean that slower riders should buy aero equipment. In reality the answer is, sure, why the hell not, do whatever you like! However if we frame it as an engineering question it might be, “how best can a rider improve their speed?”. I think this question makes much more sense. In a perfectly flat time trial scenario there are two ways to do this. Reduce your drag or increase your propulsion. If you’re already going really quickly then you’re either producing huge amounts of force, have amazing aerodynamics or you have a nice balance of the two. If you want to increase your speed first examine what area can give you the biggest yield. For a slower rider this might be much easier. If you’re going slowly you’re either producing low force, have huge drag or have a bit of both. The VAST majority of a cyclist’s drag comes from the rider rather than the bike. Improving position can give big aero improvements for no cost. Time trial bars can be low cost and allow a better riding position with much improved aerodynamics. Then there’s propulsion force. If you’re going slowly a fixed increase in propulsion force will give much bigger increases in speed than a faster rider (who’s already producing much larger amounts of force anyway). I hope I’ve explained my thoughts correctly here. In summary, if you’re a fast rider the chances are you’re already taking advantage of improved aerodynamics. If you’re going slowly, you’d be able to get proportionally greater increases in speed by improving your power output. If you’re really serious about increasing your speed, you should do everything you can! Fascinating reply, thank you very much. On the topic of Froome’s descending style it’s a bit of a problem for any of us coaching junior riders because they will of course copy his technique. In fact they have already! It would be very powerful to be able to teach them that not only is it clearly dangerous but also not very effective / necessary. On my ‘hobby’ topic of aero kit: All bike and component manufacturers are busy bringing out new, more aero kit and making substantial claims: 5watts less here, 8watts less there. We all want “free” speed since it’s much easier than training harder but we are all getting lost without any sensible comparative data. Still, I guess that is what Twitter and bike cafes are for! Something to consider here too. When a manufacturer claims power savings from Aero kit it would be useful if the associated conditions are given. For example, at high speed forces are much larger and so ‘power savings’ from aerodynamics are larger. As a result the power rating they give isn’t the same for all riders. Hence a ‘set’ increase in your own power gives much larger yields at lower speed. The key thing is, assuming you have a finite budget and can only focus on one or two things, you must pick the things to give the biggest gains!